Hoard of 4957 Roman coins from Chalgrove in Oxfordshire on display in the Ashmolean’s Money Gallery. The jar revealed a coin of Domitianus, an unknown Roman emperor of AD 271. Visit the Live Web App to explore the hoard data (currently containing 7,400 hoards and 2.5 million coins). Thousands of coin hoards have been found throughout the geographical area which once constituted the Roman Empire. 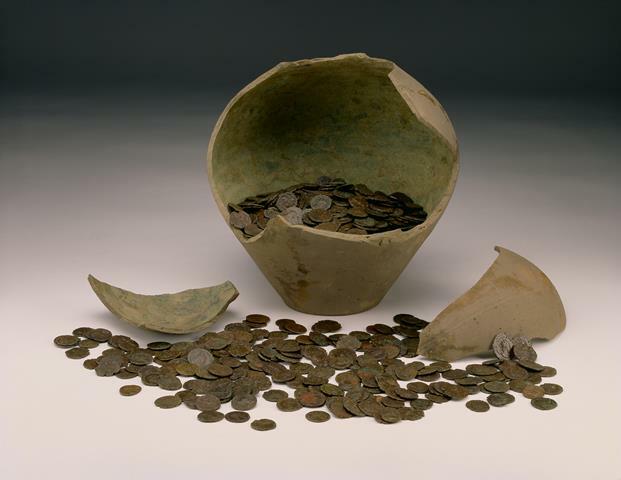 The information provided by these hoards has the potential to transform our understanding of coin supply, circulation and use, as well as having implications for the study of the Roman Economy as a whole. However, at present there is no comprehensive summary of this data and without this, their potential cannot fully be realised. The Coin Hoards of the Roman Empire Project intends to fill the major lacuna in the digital coverage of hoards from antiquity. Its aim is to collect information about hoards of all coinages in use in the Roman Empire between 30 BC and AD 400. Imperial Coinage forms the main focus of the project, but Iron Age and Roman Provincial coinages in circulation within this period are also included to give a complete picture of the monetary systems of both the West and the East. The intention is to provide the foundations for a systematic Empire-wide study of hoarding and to promote the integration of numismatic data into broader research on the Roman Economy. The project is the brainchild of Baron Lorne Thyssen and is generously funded by him through the Augustus Foundation. It is co-directed by Professor Chris Howgego (Ashmolean Museum) and Professor Andrew Wilson (OxREP) and is a joint venture between the Ashmolean Museum and the Oxford Roman Economy Project. During the first phase (2014-2018), summary hoard data from as many Roman provinces as possible will be collected by the project’s Research Fellow, Dr Philippa Walton and by numerous project partners, both in the UK and abroad. These data will include details of the contents, date and context of each hoard. A selection of hoards will also be inputted at the level of the individual coin with accompanying images, where available. As the project progresses, the database with accompanying analytical and mapping tools will be made available as a web application on the OXREP website. A conference to be held in 2016 will focus on the analysis and discussion of hoard data and its implications for the Roman Economy and a monograph based on this conference will be published by Oxford University Press in the series Oxford Studies on the Roman Economy. The CHRE Project is directed by Prof. Chris Howgego and Prof. Andrew Wilson. Further information and a full list of team members can be found on the CHRE website. The project supplements the initiatives of the American Numismatic Society in creating the Digital Inventory of Greek Coin Hoards (IGCH), and Coin Hoards of the Roman Republic Online. It has also been designed to be collaborative in nature, with numerous partners providing relevant data. For further information about the project, please visit the Coin Hoards website or Facebook page.